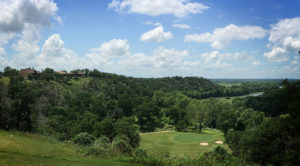 ColoVista Golf Course is a beautiful Texas Hill Country golf course overlooking the Colorado River. Maintaining a tradition of harmony with the natural environment, ColoVista uses the rugged topography of this beautiful site to create exciting and challenging play for all ages and skill level. What makes playing ColoVista an experience to remember is that it has two very different nines. The front nine plays in the valley and is a traditional links style course with wide open fairways, some water and more than a few bunkers. 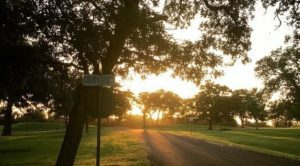 Make no mistake – due to the often present prevailing wind, this is a strategist’s layout. And there’s no better way to start your round than the exhilarating 1st tee box at the par 4 opening hole. If you’re playing from the tips (468 yds), you’ll need to gather your swing thoughts rather quickly as the box is just a few feet from the back door of the clubhouse (see pic, below). The back nine is very different with tight tree lined fairways, huge elevation changes, rolling fairways with ups and downs and sharp dog-legs. It’s a tighter layout with just as much risk and reward. But the beautiful vistas make for a nice experience regardless of your score. Augusta National has it’s Amen Corner; PGA National has the Bear Trap. ColoVista has the ColoCoaster. 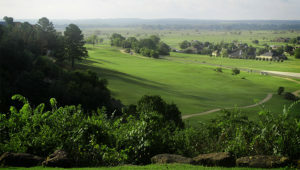 Holes 14-16 treat you with all the rises and falls that you could ever hope for with Hill Country golf. But none more breathtaking than the Par 3 15th. Played from the blue tees, it’s 171 yards to the green center. The drop in elevation will step you down at least 2 clubs. But the direction of the wind can factor just as much. You’re just as likely to get a tail wind as you are a headwind.